p.s. I've been meaning for a while, to go attend Woody and his dixieland band playing in Michael's bar or wherever it is on Manhattan's upper east side. It's a trek though. As far as his films, it's a shame if he apparently keeps milking the same tired themes over and over. That's certainly not in the tradition of his mentors like Fellini and Bergman. Personally, he creeps me out a little bit. It's not just one, but at least 3 of his films that deal with either having an established relationship with an underage or young girl, or pursuing an underage or young girl. I could handle 1 single film dealing with this topic, but 3? I prefer other things of his like "Radio Days" or "Manhattan Murder Mystery." You can just choose to have discretion when picking one of his movies to watch. That being said, I can understand why he would be upset if Amazon really did sign official documents and are now trying to back out of their deal. Personally I haven't watched hardly any of his movies since The Purple Rose of Cairo, being that I liked the idea of walking in or out of the movie screen better in Buster Keaton's, Sherlock Jr. I also pretty much abhor films with Mia Farrow in them, so that was a roadblock too. I'm sure he's made some good films though, so maybe he can get Mariel Hemingway to star as the fifteen-year-old kid's grandma in this one, but at another studio? My favorite film of his is The Curse of the Jade Scorpion. I don't get why it was so critically panned. I thought it was a funny send up to screwball comedies and mystery films of the 30s. if only the casting couch could talk. Now he can be an elf. I was wondering the same thing as I can't remember all the details of the accusations by Mia Farrow. 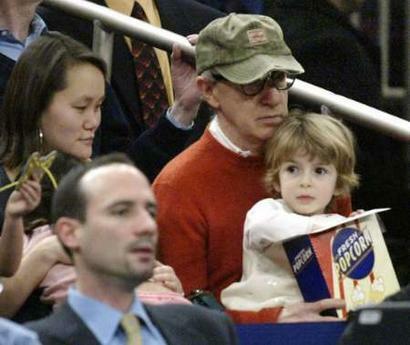 All I can remember is something about Farrow finding photos of the adopted daughter on the mantle or something, when she was still married to Allen, which showed some problematic potential. Personally I would not want to be married to Farrow, and that is based on what Old Blue Eyes told me. with a 15 year old girl, but the girl thinks he's really 70. Just a thought. Or maybe the girl can be 15 in dog years, which means she'd really be a 105 year old dog. by animals and kids and here you sort of have both in one character. Could be a problem. Of course we know Allen's not interested in telling stories about women over a hundred. Even though he's approaching a hundred himself. No, that was Hollywood Ending. Jade Scorpion had Helen Hunt. This is kind of a stupid case to expose and highlight the censorship problem going on with the tech giants right now, but if so, so be it. Every little bit helps. Maybe a film "Mommy You (May) Have Competition"
WHAT THE HECK, he's sitting in the same seat (from my last post)!!! To me this looks like a simple contacts case; does the contract give the company the sole right to determine if a film is released or not? In my view the issue is turning liberals into conservatives, where they are now much more judgmental and censorious than ever before. One could argue they've always been censorious, just about a different range of things than conservatives. I'd also use the term puritans instead of conservatives. He probably has season tickets. Jade Scorpion is the one where the magician tricks Helen Hunt and Woody Allen into falling in love everytime they hear the words "Constantinople" and "Madagascar."